Purpose: Use this document as a reference for requesting or reporting absences in ctcLink. Audience: Faculty and staff that are required to request absences. Reporting an absence or requesting an absence that uses accrued time requires additional steps. Click the Request Absence link. Enter a new start date in the Start Date field, if necessary. Click the Filter by Type drop-down menu and select the appropriate leave option. Click the Absence Name drop-down menu and select the appropriate option. The options in the Absence Name menu are based on the leave option selected in the previous step. Click the Reason drop-down menu. 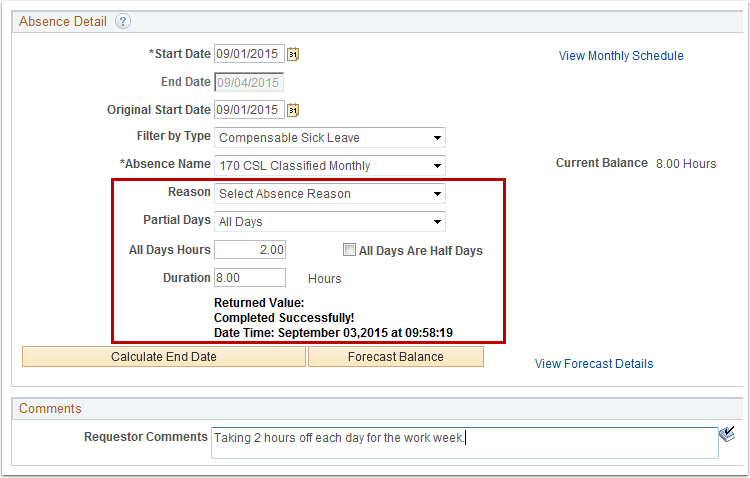 The options in the Reason menu options are based on the type of absence selected. This field is optional. Enter comments in the Comments section, if necessary. Click the Forecast Balance button. Note: The End Date field populates when the Forecast button is clicked. The Returned Value message displays indicating the success or failure of the transaction. Click the ViewForecast Details link to see additional details. The Request Details page will display. 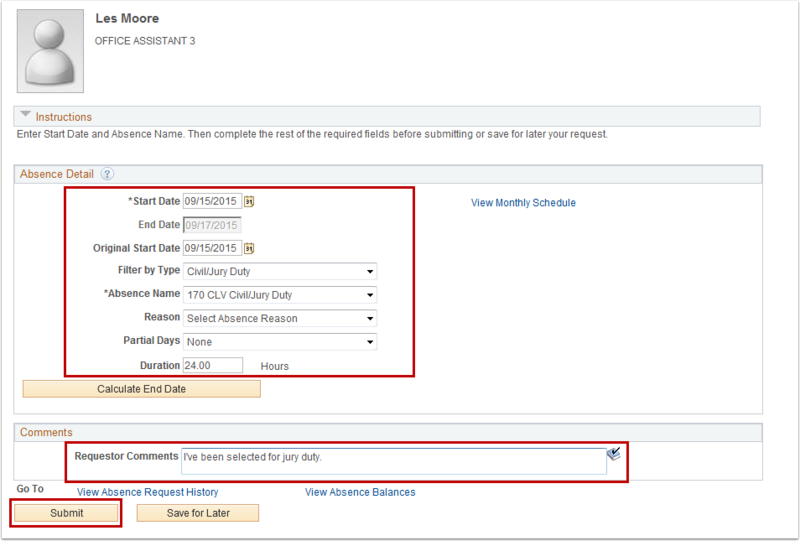 View the Request History section and also the approval status of the absence. To view the absence information on the timesheet, click the Timesheet link. The absence will display on the timesheet as “Read Only” and in the ReportedTime Status section. 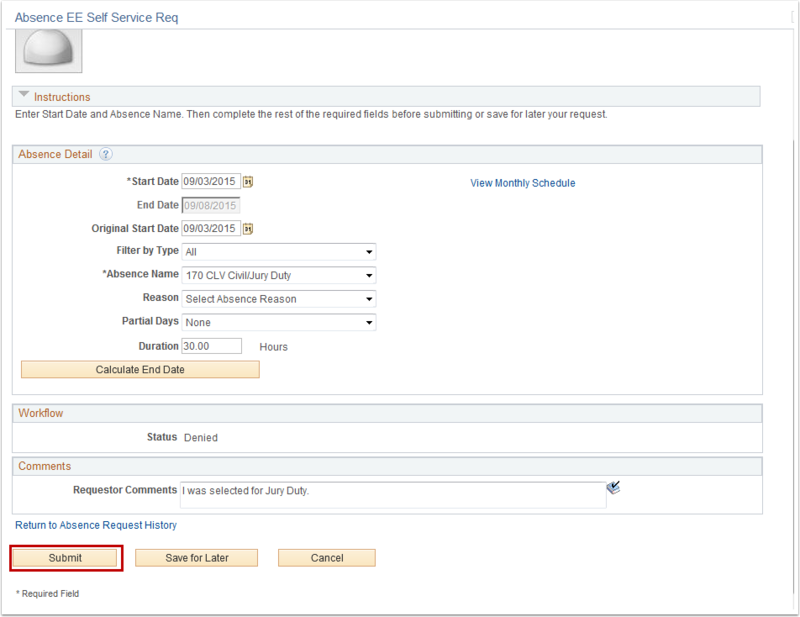 Enter the start date of the absence in the Start Date field. Click the Reason drop-down menu and select the appropriate option. 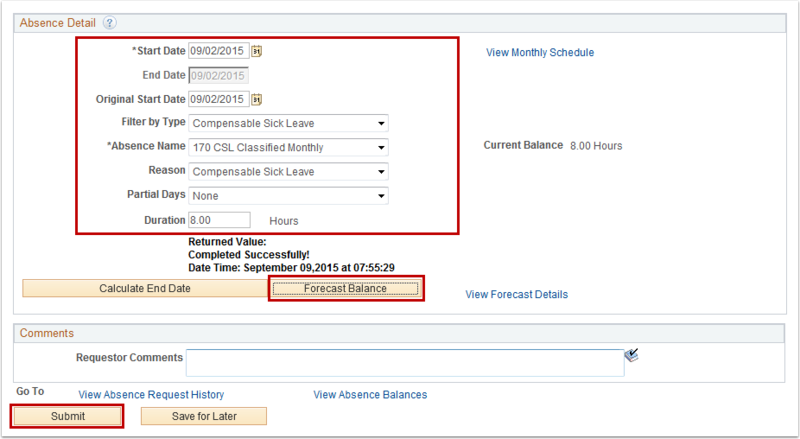 The options in the Reason menu options are based on the type of absence selected. This field is optional. 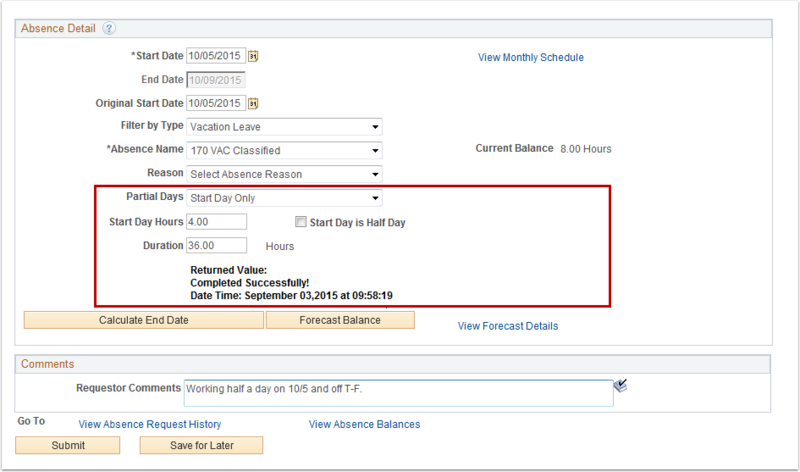 If using full days, leave the Partial Days field as None. Click Calculate End Date to populate the End Date field. Enter comments about the absence if required. A notification is sent to the supervisor for approval. A notification will be sent to the employee with the supervisor’s decision. 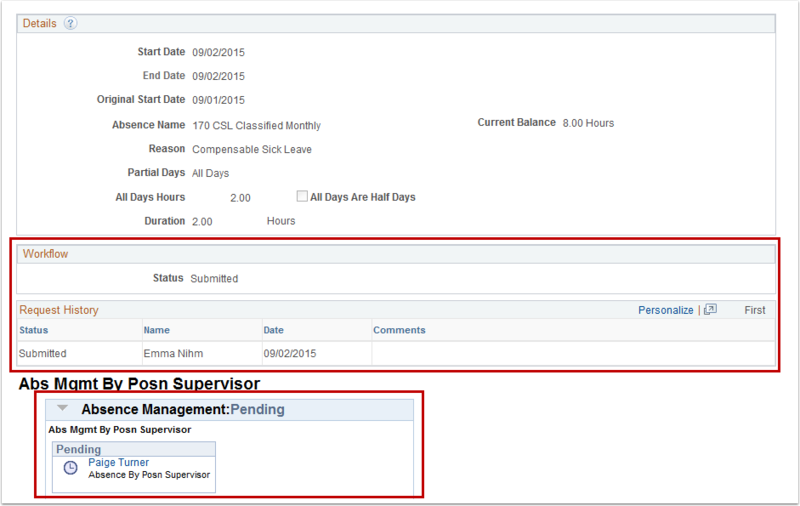 To check the status of the absence request, click View Absence Request History. If you need to break up time over a period of days, use the options in the Partial Days field. Below are a few examples of when to use Partial Day. Employee wants to use 2 hours of vacation time for each day during the work week. Enter the appropriate start date in the Start Date field. Click the Absence Name drop-down menu and select the appropriate option. Note: the End Date, Reason, Partial Date, and Duration fields display. Select All Day from the Partial Days drop-down menu. Review the timesheet to ensure the hours are properly placed. Employee wants to go on vacation for a week, but they need to work half a day on Monday and take the Tuesday through Friday off. Select Start Day Only or End Day Only from the Partial Days drop-down menu. Enter the amount of time wanted off in the Start Day Hours field (Ex. 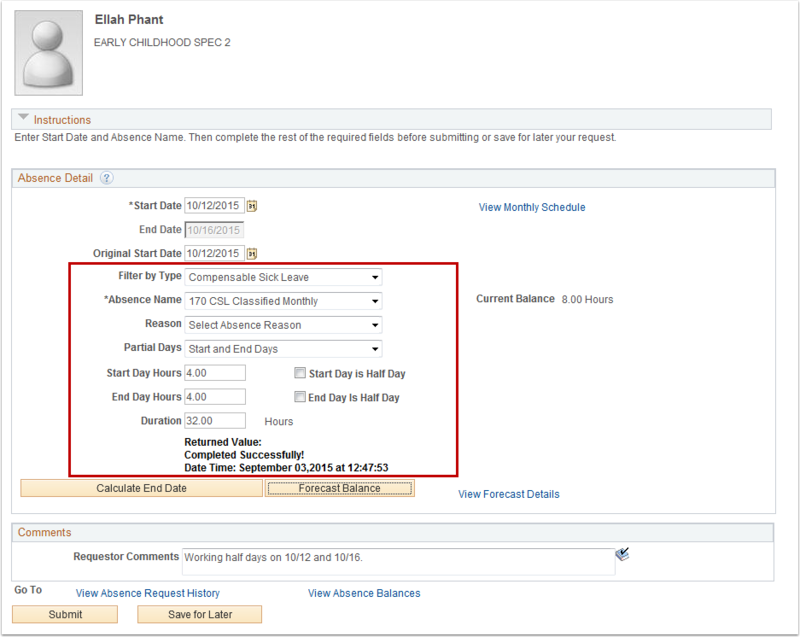 4 hours) or if End Day was selected, enter the amount of time wanted off in the End Day Hours field. Employee wants to use full vacation days on Tuesday through Thursdays, but work half days on Mondays and Fridays. Select Start and End Days from the Partial Days drop-down menu. Review the timesheet to make sure the hours are properly placed. 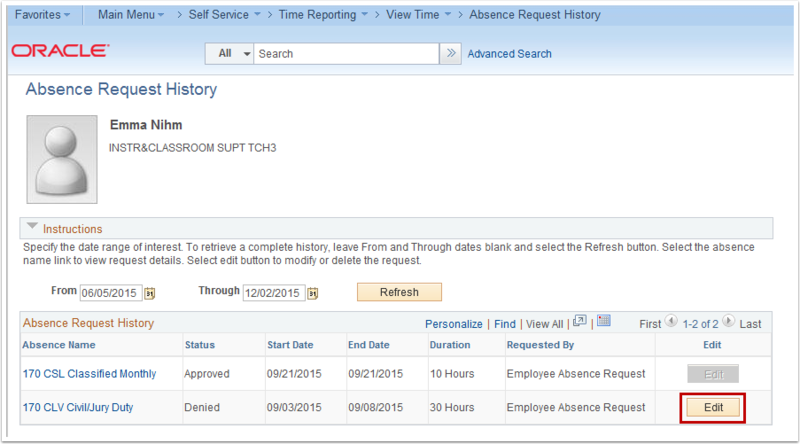 Click the View Absence Request History link to view a list of absences requested and their status. 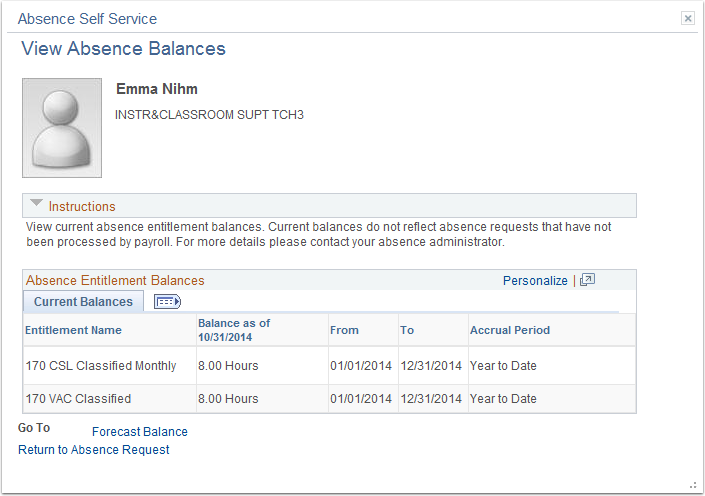 Click the View Absence Balances link to view balance information for accrued time. Note: If navigating from the Gateway, click the HCM link on the top of the page. Click the Edit button for the appropriate absence. Note: Submitted or Approved absences cannot be edited. 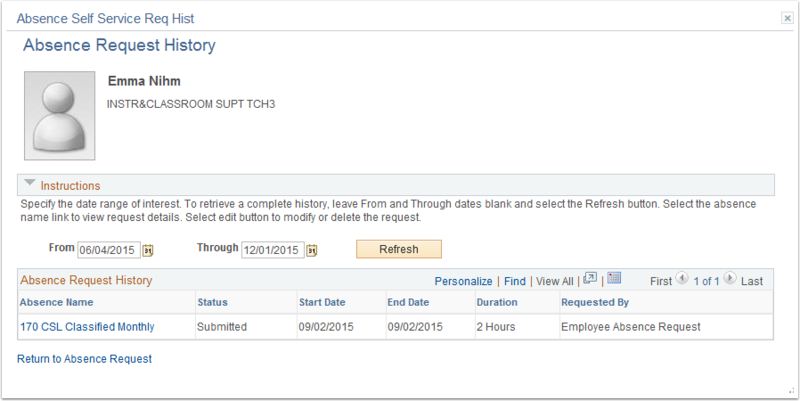 Make the appropriate changes on the Absence Request History page and click the Submit button. The absence request is routed back to the manager for approval.